Windows 8 tablets can connect with just about any printer that works with your desktop PC. Most printers connect either through a USB port or through a wired-or-wireless network. USB: The simplest way to connect with a USB printer is to plug the printer’s USB cable directly into your tablet’s USB port. Your tablet will connect with Windows Update, download any drivers, if needed, and automatically set up the printer to work with your programs. Network and wireless: Once you create a network, your tablet will have access to all the printers shared on that network. Open the Charms bar by sliding your finger inward from the screen’s right edge. Tap the Settings icon; when the Settings pane appears, tap the words Change PC Settings. The PC Settings screen appears. Tap Devices from the PC Settings screen. The PC Settings screen shows every device attached to your printer. They’re listed alphabetically, and attached printers have the icon seen in the margin. From within any app, open the Charms bar by sliding your finger inward from the screen’s right edge; then tap the Devices icon. The Devices pane appears, listing all the devices capable of working with your app. (Their icons look like the one in the margin.) If you see a printer listed, move to Step 2. No printer listed? Your app isn’t able to print, unfortunately. Tap the desired printer’s name and make any final adjustments. The Start screen’s Printer window sums up exactly what’s going to the printer. It shows a preview and the number of pages required. 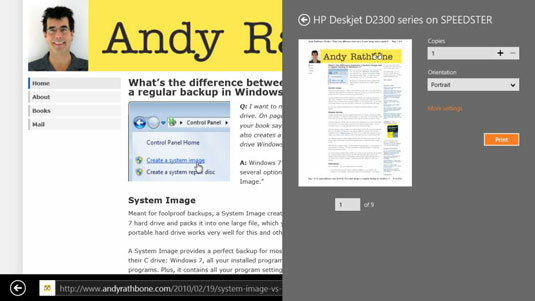 To see all of the pages you’re printing, slide your finger across the preview image from right to left. To see even more options, tap the More Settings link. There, you can choose the type of printer paper you want to use, an essential step when using photo paper on a color printer. Many apps can’t print. You can’t print a day’s itinerary from your Calendar app, for example, or even a monthly calendar. When printing from the Start screen’s Internet Explorer app, you’re stuck printing the entire web page — advertisements, comments, and everything in between. There’s no way to print selective portions. If you need more control over your print jobs, it’s time to head for the desktop and its cadre of more full-featured programs.